Professional Google My Business listing optimization and Internet marketing. Welcome to Near Me Local Search! We connect small businesses with quality clients. We provide excellent references and excellent service. We provide real world results. Google search is by far the most used method for a potential customer to hire a business. 4 out of 5 consumers use search engines to find local businesses and 78% of the on-­the­-go searches turn into offline purchases. 63% of these searches are now queried on a smart phone. That is a lot of clients to miss out on and if you don't have an optimized and professional Google My Business listing, you are doing just that... missing out. Clients type or speak a keyword or phrase and Google returns 4 relevant pay per click ads, 3 Google My Business local listings and then 10 organic websites and directories and then more ads. More than 90% of Google’s yearly profit is derived from revenue generated from ad­words. Each time the client clicks the PPC ad, it costs the business a few dollars. Some businesses do very well on their return on investment, but most do not. A better way to market a small business is to take advantage of the free clicks and calls a top Google My Business local listing can provide. Local searches lead to more purchases than non­local searches. The top local business listing garners 90% of the clicks, with 8% going to the next 2, and then 2% for the rest. 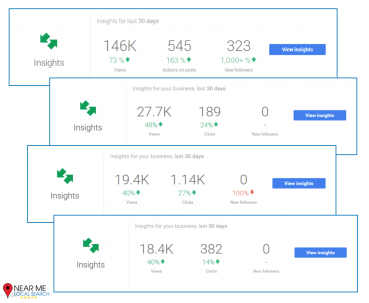 Near Me Local Search optimizes Google My Business local listings and builds a keyword funnel to drive clicks and calls from potential clients to your business and not your competitors. Each Google Business Listing is connected to Google +, Google Maps, your business website, and your business Youtube channel. Google has over 1.2 billion unique users per month and is an amazing marketing opportunity for small businesses. Near Me Local Search improves your business’s web presence by improving your website’s SEO, mobile friendliness, loading time, trust, and reputation just to help your local business listing rise above your competitors so you get most of the new calls. Near Me Local Search improves the scope and quality of your Youtube videos just to improve the ranking of your Google Business listing. Near Me Local Search fixes all your business’s online mistakes such as duplicate content, coding errors, inaccurate or incomplete citations, bad links, and every negative issue to push your Google Business listing to the top. Near Me Local Search uses every possible advantage Google Plus offers, such as keyword rich pictures, local keyword rich G+ posts with effective hashtags, Google Inside, and focuses your call to action so your Business Listing is respected and trusted by Google and your future clients more than your competitor’s listing. 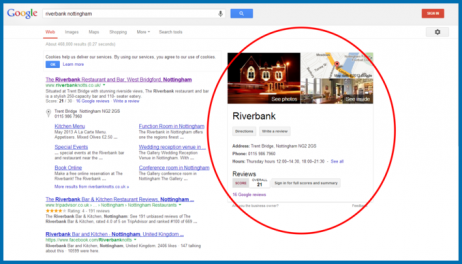 Near Me Local Search improves your business by improving your rank for your Google My Business listing. When your local listing ranks well, so does your website and your bank account. Near Me Local Search makes you money and saves you money.